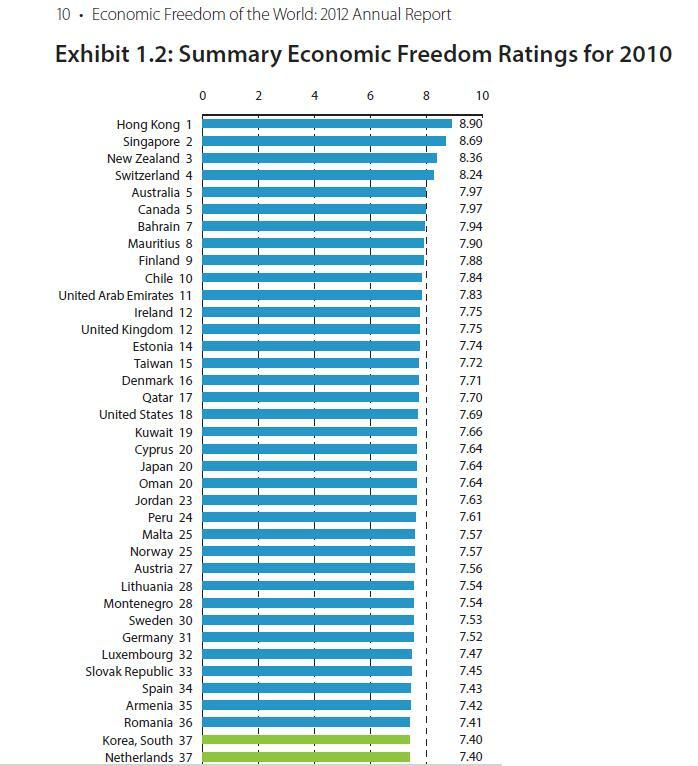 And just look at the ranking of Singapore in this all inclusive rating. All hail Lee Kuan Yew! Sloppy graphing takes much from your otherwise important comment. Your graph was difference from a position of third, I think. Then the current position should be -15, not -18. Once you are in the deadly embrace of the vicious cycle, it is nearly impossible to escape. It is all momentum from now on. Economic distress? Voters will head to the polls for more “help”. So even the rankings are pointing to the fact that decline not only continues, but seems to be accelerating. BTW, HopNChange reads these rankings backwards, so expect further declines in the future. The point of no return passed long ago for Americans. America haters throughout the world must be rejoicing that America has finally stepped on the same banana peel of mandatory collectivism. 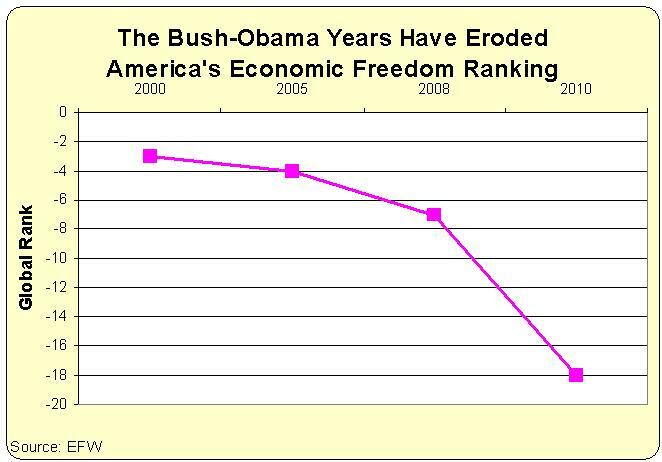 Not only is America becoming more Socialist but is declining too! A win-win for leftist America haters. Meanwhile, American voter lemmings will continue their death march, like many other peoples before them. Different flags, new slogans but same path to self-destruction: Mandatory collectivism. Naive Americans oblivious to the fact that the same sirens if HopNChange and its shortcuts to a more compassionate prosperity have bamboozled many one cultures before them into mediocrity. While decline is certain, the details are more difficult to predict. Like I have noted before, a pot to which heat is applied will boil. Predicting when it will boil is a little more difficult. Predicting HOW it will boil, where the first bubbles will appear and how they will interact with other bubbles is virtually impossible to predict. But one thing is certain, the pot will sure boil. Likewise, a country that is rejecting its unique historically serendipitous individualism and starts mimiking the rest of the world in the mandatory collectivism that is the norm in most other places, will also converge economically to average worldwide prosperity levels. I don’t think we’ll become Greece, like Mr Mitchell often says, perhaps figuratively to make a point. I see America’s future at an equilibrium point between France and Argentina. Of course, France is already entering the next phase towards Greecificatoon, so ultimately Mr Mitchell is right. But there is another reason Mr Mitchell may be literally right when it comes to Greecefication. The pace of decline of the US is so precipitous that decline momentum may blow past the Franco-Argentinian equilibrium stage, straight into Greece. But I think at some point some modest remedial action will be taken, so some deceleration will occur, so I still vote for the Franco-Argentine equilibrium era scenario which will last a few years. The next major event in the decline is likely to be a spiraling loss of credibility on US debt, at which point we will get something like VAT almost overnight, cementing our Francification trajectory. But in any case, “Let’s HOPE the CHANGE will be Franco-Argentina and not Greece!”: That describes the pathetic state of the American electorate and it’s rejection of the very American values of individualism that once propelled this country to the forefront of prosperity. Hopefully, other countries (hopefully bigger than mere city states like Hong-Kong and Singapore) will pick up the baton. If not, we may all end up in an OECD jail, and then we’ll really get to meet Mr. Mitchell. OK, I admit that there was a moment of schadenfreude due to the fact that I now live in a country more free than the US. That moment ended when I saw that that’s because the US has become less free, not because Estonia has become more free, most recently. The big story seems to be the decline of the Anglosphere: it used to be that 5 or 6 of the top 10 in the efw were English-speaking countries. Now it’s just 3. Still, the other 3 are in the top 20, and they can recover with some hard work and determination. NB: the 2012 index actually reports on the situation in 2010. The current situation in the US and UK is likely to be even worse.